The playful and curious Bottle Nose Dolphin will happily interact with humans. Bowing riding Bottle Nose Dolphin in the Bay of Islands, New Zealand. The Bottle Nose Dolphin, although found through the world's ocean are mostly found in temperate and tropical waters. A Bottle Nose Dolphin lives in a family group called a pod and often members of other pods will join together to create a large herd often for purposes of hunting. Their name comes from the shape of their beak which is similar to that of a bottle. The Bottle Nose Dolphin scientific name is Tursiops truncatus. 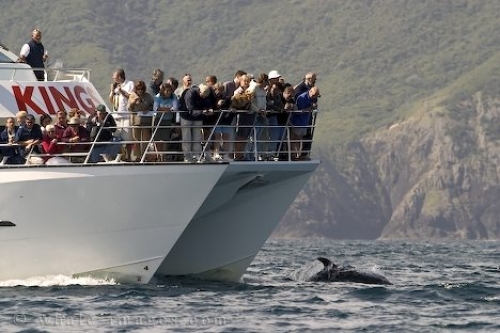 Picture of a tour boat being led by a Bottle Nose Dolphin in the Bay of Islands, New Zealand.